This is a cd for ‘travelers’ – for those on a journey seeking an extraordinary life. kenny schick – guitar, vocals, percussion, kazoo & hooveroo. other musicians: sabine heusler – vocals (3,7,9,10), heather courtney – vocals (4,11,12), lyndie way – vocals (4,6), db walker – dobro & guitar (2,10), rain cruz – percussion (1,2), gordon gurley – sandpaper (6), steve crain – cello (1), david sierra – upright bass (6,11), pam page – violin (9). all songs (*except ‘revelator’ – welch/rawlings ©2001 cracklin music & irving music) were written, performed, recorded, and mixed by kenny schick – additional mixing by jerry ososkie. mastered to 2-track analog tape by jerry ososkie @ J31 studios, CA. photography by kenny & design by sabine. 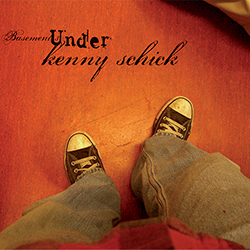 © 2007 kenny schick – basement 3 music, unauthorized duplication is naughty and just plain rude. written and recorded in australia and california.